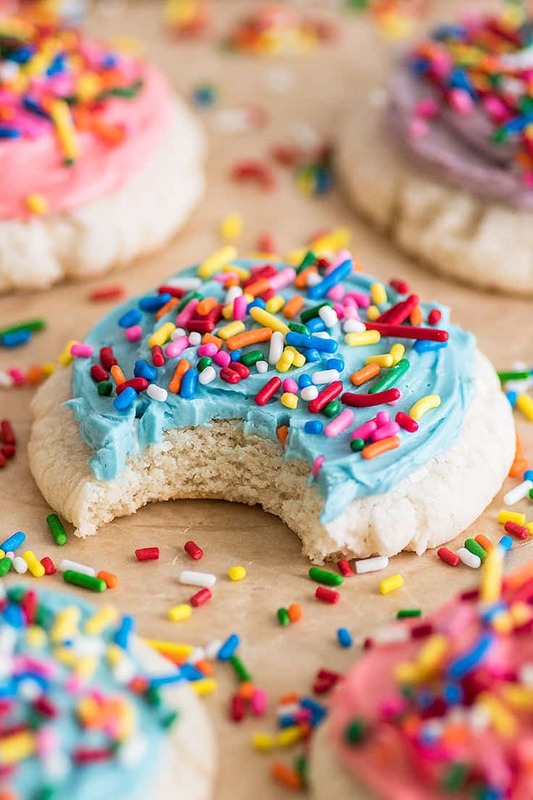 This Small-batch Frosted Sugar Cookie recipe is exactly what you want from a frosted sugar cookie: soft, with just a little chew, a hint of vanilla, and a borderline excessive amount of frosting. Plus sprinkles. Never forget the sprinkles. Hey, friends, it’s been a couple weeks since I last posted a dessert around here. The last ones were these Chocolate Banana Muffins (SO good) and Chocolate Cookie Dough Cupcakes (Cookie dough!!!) at the end of February, and that was too long ago. So, here today to make your life a little sweeter, I have Small-batch Soft Frosted Sugar Cookies. Folks, if ever there were a recipe that needed to be made small batch (this recipe makes just six), it’s Frosted Sugar Cookies, because these things are ADDICTING. My test batches were *immediately* boxed up and distributed to family because if I had kept all the cookies, I would have eaten ALL THE COOKIES. And oh man, these are some good cookies. 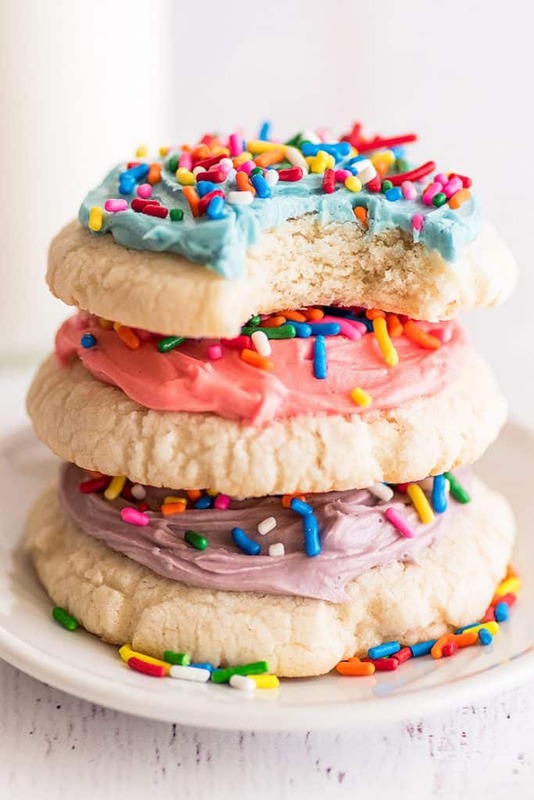 They’re exactly what you want from a frosted sugar cookie: soft, with just a little chew, a hint of vanilla, and a borderline excessive amount of frosting. Plus sprinkles. And the best part? There’s no dough chilling required, and they couldn’t be easier to make. To get nice soft, fluffy cookies, this recipe starts with creaming butter and sugar. That means you need softened butter. If you’re in a hurry and want your cookies ASAP, measure out your butter, cut it into small pieces, and set it on a plate somewhere warm in your kitchen. Preheat your oven and measure out all your other ingredients while you wait, and within about 15 minutes, your butter should be ready to go. If you’re not sure if your butter is the right temperature, give it a little press with one finger. You should easily be able to squish an indentation into the butter, but the butter around it should still keep its shape. Once you have properly softened butter, these cookies come together fast. You cream the butter and sugar followed by the rest of the wet ingredients and then stir in the dry ingredients. You’ll end up with a pretty sticky dough, and at this point you’d usually refrigerate the dough until it was chilled enough to handle, but waiting is the worst, so instead, you use a couple of spoons to drop dollops of the dough into a bowl of powdered sugar, toss to coat so the dough’s no longer sticky, and roll into a tidy ball. Rolling the dough into a ball helps you get perfectly round cookies (and everyone knows symmetry is extra tasty 😉 ). And the final step before they go in the oven: smash your cookies. If left on the sheet as balls, they will stay like that, so you use the bottom of a cup to smash the cookies, bake, and cool. Then it’s time to slather on some really good frosting. An American buttercream is my favorite frosting when it comes to sugar cookies. I think the rich creaminess of the butter and the sweetness of the frosting (American buttercreams are SWEET) is nicely offset by and really enhances the mild vanilla sugar cookie. For this recipe, I used my Small-batch Vanilla Buttercream Frosting, but any of the other small-batch frostings on the site would be an excellent choice, especially Chocolate Frosting or Cream Cheese Frosting. 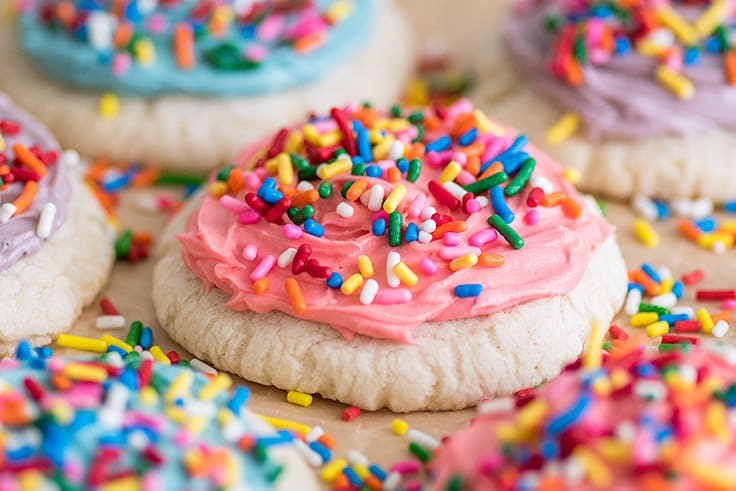 Swirl on that frosting with a knife or offset spatula, cover with a mountain of sprinkles, and enjoy your perfectly pretty Frosted Sugar Cookies. 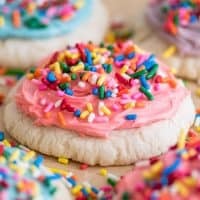 If you’re not worried about getting the most perfectly round cookies, you can skip the powdered sugar/rolling-into-a-ball step and use two spoons or a heaping 1-ounce cookie scoop to scoop dough directly onto a baking sheet and then use the bottom of a glass or the palm of your hand dusted with flour or powdered sugar to gently flatten the dough to 1/2-inch thick. This recipe uses just one egg white. Check out these Egg Yolk Recipes for ideas on what to do with the leftover egg yolk. Looking for more Small-batch Cookie Recipes? Try my Small-batch Cut-out Sugar Cookies, Small-batch Chocolate Chip Cookies, and Small-batch Peanut Butter Cookies, or check out my entire Small-batch Dessert Recipes archive. In a medium bowl, combine butter and sugar and cream together until light and fluffy, 1 to 2 minutes. Add egg white and vanilla extract and beat until well-combined. Add flour mixture and beat until mixed. Dough will be fairly soft and sticky. Place powdered sugar in a small bowl and drop a 1 1/2-ounce spoonful of dough into the powdered sugar. Toss to coat and roll into a ball. Place dough on your prepared baking sheet and repeat with remaining dough. This should make 6 cookies. Use a flat-bottomed glass or the palm of your hand to smash each cookie dough ball until it is 1/2-inch thick. Bake for 9 to 12 minutes, until cookies look set and the bottoms are lightly golden. Do not overbake. Allow cookies to cool on the baking sheet until cool enough to handle before transferring them to a cooling rack. Cool completely before frosting. In a medium bowl, beat softened butter until fluffy. Add powdered sugar, 1 teaspoon of the milk/cream, vanilla, and salt and beat until smooth. Add milk by the 1/4 teaspoon until frosting reaches your desired consistency. Add a couple drops of food coloring to color if desired. 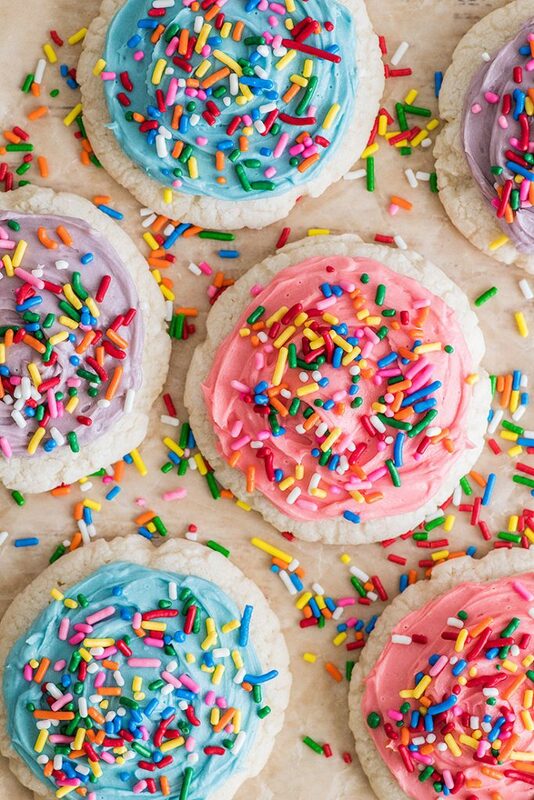 Use a knife or offset spatula to swirl frosting onto the cooled cookies. Top immediately with sprinkles and enjoy.